Here are the slides of the talk I am giving today at the SERMON 2019 conference. It is similar to previous talks I have given on primes that are values of cyclotomic polynomials, but with more emphasis on Brazilian primes, in particular Brazilian Sophie Germain primes. When my first journal article was published in 1995, putting reprints on my personal web site seemed very advanced compared to keeping them on a shelf in my office. Times have changed, however, and arXiv.org seems like a more permanent repository for the reprints than pseudoprime.com. And, frankly, more permanent than some of the journal web sites. So you can now see all of my reprints (and preprint!) at this arXiv link. A preprint of "Brazilian Primes Which Are Also Sophie Germain Primes" is now available on the math arXiv. In it, Hester Graves and I disprove a conjecture from Schott's 2010 paper on Brazilian primes, namely that no Brazilian primes are also Sophie Germain primes. What does this mean? A Brazilian prime is a prime number of the form 1+b+b2+...+bk-1, i.e. a prime whose digits are all 1 when written in base b. (To avoid silliness, you need k>2 and b>1.) For this reason, they are sometimes called "prime repunits". A Sophie Germain prime is a prime p such that 2*p+1 is also prime. If you just start computing Brazilian primes, most of them will be of length 3. We show that the length of a Brazilian Sophie Germain prime has to be a prime congruent to 2 mod 3, i.e. 5, 11, 17, 23, etc. In the paper, we computed all Brazilian Sophie Germain primes up to 1044. There are 38,031,404 of them, all but 12 of them of length 5. The 12 exceptions are all of length 11. The smallest one of length 17 is 41969813142886369903423014255641324842178685773056721, which is bigger than 1052. We have actually computed all Brazilian Sophie Germain primes up to 1046 (there are 104,890,302 of them) and 1048 (we haven't counted them up yet). A later version of the preprint will reflect that. Submission of the sequence of Brazilian Sophie Germain primes is in progress. A later version of the preprint will also reflect that. 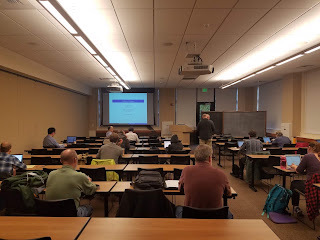 In my continuing series of talks on work with Hester Graves on primes which are values of cyclotomic polynomials, I am giving a talk today at the MASON III conference at James Madison University. Here are the slides. Here are the slides for a talk I am giving tomorrow at the MASON conference in Towson, MD. They are almost identical to the slides for the talk I gave last month at the SERMON conference. I did, however, get some excellent questions last month that have changed the way I think about the problem, so I hope to incorporate those insights into the talk itself. Here are the slides for a talk I am giving this weekend at the SERMON conference in Johnson City, TN. The basic question addressed is as follows. Look at all numbers a such that a2+1 is prime. (The sequence starts 1, 2, 4, 6, 10... ) Goldbach conjectured that any number (other than 1) in that sequence is the sum of two previous numbers. So 2=1+1, 4=2+2, 6=2+4, 10=4+6, etc. We verify this for a up to 2*1014 and explore how easy it is to find these sums. This is joint work with Hester Graves.